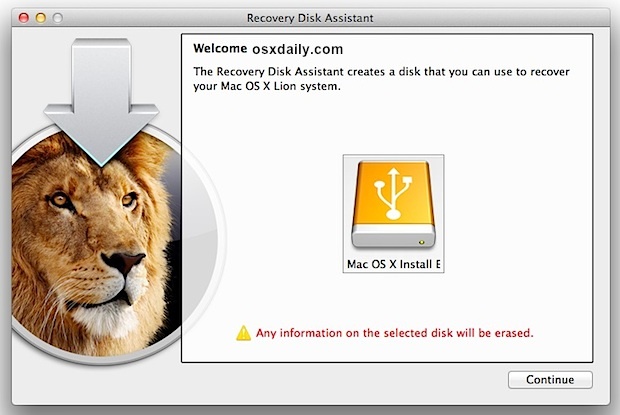 Apple has released Lion Recovery Disk Assistant, a small utility that provides the ability to create an external bootable recovery drive for Mac OS X 10.7 Lion. This should quell some of the complaints from users who didn’t want to make a Lion USB install drive or boot DVD, or who were otherwise unsatisfied with the Lion Recovery HD partition because it existed on the same boot disk. Even if you made your own Lion boot disk, it’s a good idea to create one of these Recovery disks as a troubleshooting tool. tested out the utility and it works flawlessly, with the same features you get booting from the Recovery partition, allowing you to perform an OS X install, run Disk Utility to format, partition, etc, Time Machine backups, and internet restores. A few quick notes: this does not create a general Lion installer that can be used to upgrade other Macs or install Lion on other Macs, it’s a recovery disk. If your Mac shipped with Lion, it will only work on that Mac, but if your Mac was upgraded from Snow Leopard then it can be used on other Macs upgraded from Snow Leopard too. See here for making a general OS X Lion install and upgrade drive. The Lion Recovery Disk Assistant lets you create Lion Recovery on an external drive that has all of the same capabilities as the built-in Lion Recovery: reinstall Lion, repair the disk using Disk Utility, restore from a Time Machine backup, or browse the web with Safari. Note: In order to create an external Lion Recovery using the Lion Recovery Assistant, the Mac must have an existing Recovery HD. 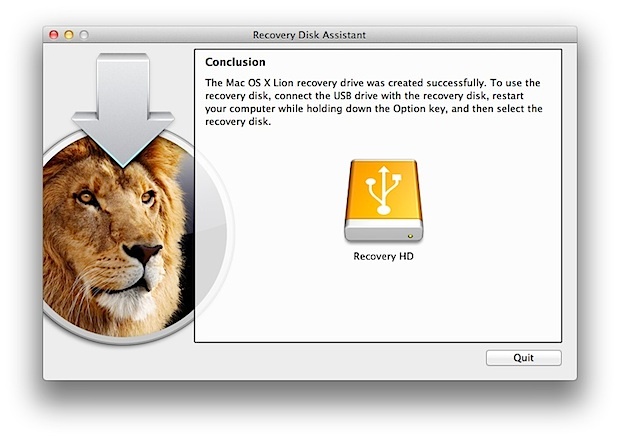 To create an external Lion Recovery, download the Lion Recovery Disk Assistant application. Insert an external drive, launch the Lion Recovery Disk Assistant, select the drive where you would like to install, and follow the on screen instructions. When the Lion Recovery Disk Assistant completes, the new partition will not be visible in the Finder or Disk Utility. To access Lion Recovery, reboot the computer while holding the Option key. Select Recovery HD from the Startup Manager. Heads up to MacStories for coming across this first. I love that you guys actually bother to test this stuff instead of just writing nonsense about it. This is only necessary for those who have the old spinning hard drives because they fail, SSD won’t have the same problem and just wear out over time until it is slow. Any device can fail (SSD included), never hurts to have a backup. Wow, this is horrible advice. SSDs can and do fail all the time. So I presume this is literally something that does the same job as the built in recovery on the the HD partition – it is just for situations when your disk mechanically fails? Sorry – may seem a silly question but I wonder if I genuinely need to install this. Hey, this recovery disk thing actually wipes out the contents in my external drive??? I could not see the drive in my finder anymore?! Having read the article and used the application, I will note that if you delete the Recovery Partition on your Mac, you can’t use this application with without re-installing Lion and using LRDA from that new Lion install. Interesting issue and I wonder if anyone has a possible solution to this? I have been able to boot from the Recovery Partition; but LRDA will not work from the original Lion setup partition. So I wonder if when installed, the partition map is written to a file on each Lion install telling it where to find it’s respective Recovery partition. I am forget the apple id & password. Is any idea that using i can create second user id. Question; should you re-create the recovery disk after Lion is updated (such as after the recent 10.7.3 upgrade) to keep the version current? i have a macbook pro i7 and i have installed 10.8 before 2 days back. but i wanted back to 10.7 and i installed LRDA in a external Disk.BUT i dont want to use LRDA NOW…but now when I’m connecting my external disk to mac its not showing there anymore.. i checked disk utilities and my External disk is there but im not able to find out on my desktop and im not able to access those file. ..i hope u can understand my problem now..i need to fix my hard disk where i installed LRDA. Holding OPTION key to reboot for an external disk is good. But it seems not possible to use this method via a wireless keyboard. Apple store does not sell any wired keyboard anymore. So do we have to stuck with a non-Apple wired keyboard??? You download the App, to reset your password, but you have to put your password in to use the app.